Gene drawer was designed to create scaled pictures of the exonic structure of a gene as shown in figure 1. The data can be entered either manually or from a correctly structured file. 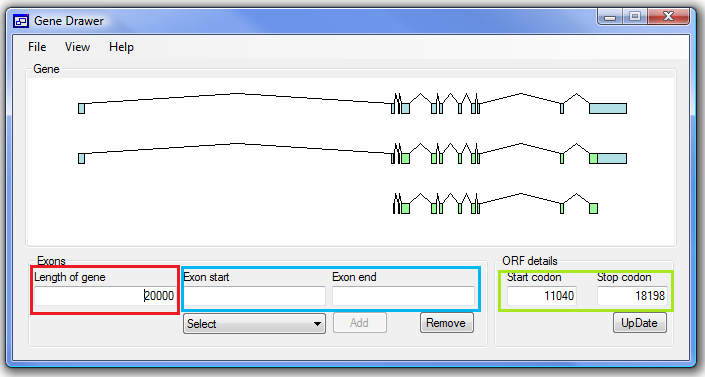 Before entering any exonic data, you must enter the length of the gene in the first text box (in the red box in the figure). Once this has been entered you can start to add exons, by adding the genomic positions of the splice sites in the ‘Exon start’ and ‘Exon end’ text boxes (blue box in the figure). The word ‘Error’ will appear in red above the text boxes if a splice site position is outside the gene region (greater than the gene length) or the is 5’ site position is greater than the 3’ sites’ position. If everything is correct the ‘Add’ button below the ‘Exon end’ box will be enabled and clicking it will add the exon. Repeat the process for each exon, if you need to delete an exon, select the exon using the list of exons below the ‘Exon start’ box and press the ‘Remove’ button. Once all the exons have been added the picture will show the basic structure of the gene, but no coding sequences are shown. To add the coding sequences enter the genomic positions of the start and stop codons in to the boxes in the ‘ORF details’ panel (green box in the figure) and press the ‘Update’ button. If these positions are found in exons the coding sequence is shown. Once data has been entered it can be saved to file by selecting the ‘File’ > ‘Save as…’ menu option and supplying a file name. Similarly, selecting the ‘File’ > ‘Open…’ and picking a file will enter data from an output file (Example file). To save a copy of the image select ‘File’ > ‘Save picture as…’ and enter the filename. This will save the picture as a ‘*.png’ file which can be viewed in most graphic enabled programs. Selecting the ‘View’ > ‘Gene colour’ options display a colour selecting dialog box to be displayed. Selecting a colour on this form and pressing ‘OK’ will change the fill colour of the exonic sequences. Selecting the ‘View’ > ‘ORF colour’ option will change the coding sequence fill colour.